Hill Harper, Alfre Woodard and Nicole Ari Parker host Democratic National Convention event at Johnson C. Smith University. As the Democratic National Convention kicked off in Charlotte, N.C., hundreds of college students packed the decked-out gym-turned-political-forum at Johnson C. Smith University and were told to do two things: prepare to ask questions and use all of their hand-held devises to Tweet, video, text, email and snap pictures about what they were seeing and learning during the event. After all, this was a cyber-summit, not the classroom. The historically Black Johnson C. Smith University and the Congressional Black Caucus Institute hosted UFuture: A Summit for Innovative Young Thinkers, to give students a chance to discuss wide-ranging issues ahead of the November presidential election. Of course, the conversation included political activism and voting rights, but also such topics as recommendations for improving the student financial aid process, Black women’s health and STEM as the new career frontier. University President Ronald Carter spoke briefly, but watched and listened intently to the energetic crowd of students. “The summit speaks to the desire of today’s young voter’s to engage in politics and receive answers to relevant issues that affect their future,” Carter says. While most of those in attendance traveled from colleges and universities in the region, others joined the conversation from Morehouse College, Morgan State University and other campuses across the country via video or other social media. Bounding about the stage in black and white high-top tennis shoes and black jeans, Hollywood actor and author Hill Harper of CSI-NY, helped keep students pumped up and the questions flowing to national elected officials, congressional members, White House staff, educators and corporate leaders making their way on and off of the platform throughout the morning. 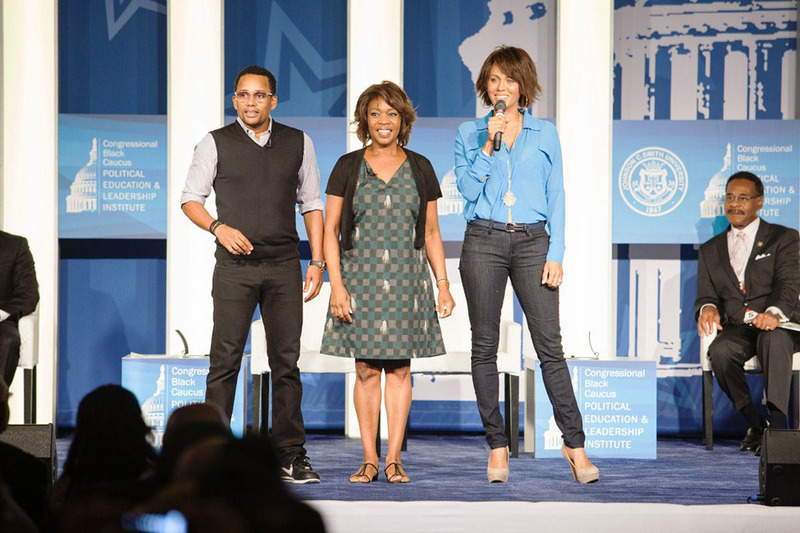 Award-winning actresses Alfre Woodard, who admitted to her gadget waving audience that she was a social media newbie, and Nicole Ari Parker, known for her starring role in Soul Food, served as summit hosts along with Harper. South Carolina Congressman James E. Clyburn and North Carolina Congressman Melvin Watt were among the legendary Black political voices invited to dole out advice, answers and encouragement to their attentive campus leaders, many of whom would be voting for the first time in the November 2012 presidential election. Ahead of introducing his oldest daughter, Mignon Clyburn, an FCC Commissioner, the Assistant Democratic Leader told students to follow her example and learn to “think independently and for yourself,” especially on education and political issues. And to remember your manners. A question that was texted in: “Is it true that 500,000 African Americans in North Carolina aren’t registered to vote?” went to Rep. Watt, who before confirming the statistic, told students that he didn’t want to embarrass them by asking if they were among that number. Instead, Watt urged them to “start with self,” if they weren’t registered, then make sure that their families and those in their communities were also registered to vote. Often, it’s not the large numbers that turn the tide of a political election, Watt pointed out. It’s the few who can make the difference when they are registered and cast votes. “I’ve been there before,” says Watt recounting tales from his early days as a campaign manager. One of his candidates was politician and architect Harvey Gantt. Watt says that 95 votes was all that stood in the way of Gantt becoming Charlotte’s first Black mayor in 1979, but the cast of people Watt knew and could enlist didn’t cast their votes. But four years later, Gantt did succeed in his mayoral win, becoming the city’s first Black mayor in 1983. There’s no shortage of political enthusiasm and engagement on his campus, says Johnson who’s tired of hearing reports that paint young voters in his age group as apathetic. “This upcoming presidential election is the most important of all elections and it’s where our vote counts. I’m learning and seeing everyday how decisions made in the 2008 presidential election are impacting my life four years later,” says Johnson who posted several Tweets during the summit under The Bulls Eye Twitter handle.